Adapter sold with the EC1001 hurricane globe shown here. Other globes may be substituted upon request. The same as our popular brass adapter, but with a pewter finish. 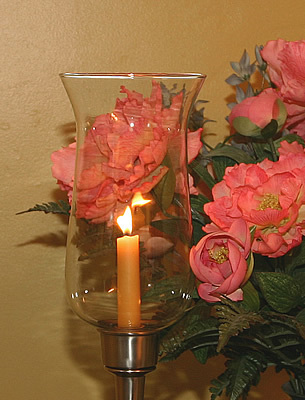 The perfect way to convert your 7/8 inch pewter candle holder into a hurricane lamp. Fits any standard 7/8 inch candle holder. This solid brass adapter has a heavy pewter plating, which is lacquered to prevent tarnishing. The adapter itself weighs seven ounces, and together with the globe the weight is one pound. I am so sorry I purchased any of these. It almost immediately smokes up the hurricane and looks terrible for the evening. Looks like the rubber gasket around it will soon fall off during successive washings. However, you were very good about a quick response to the order and it was very well packaged. Administrator Note: the globes are wrapped with the adhesive foam on the bottom as a protective measure to help prevent breakage. While we do add that to secure the globes on their sockets, it is completely optional and can easily be removed if you do not like it. If you do find it helpful but it comes off over time, we can always mail additional strips so you can reapply fresh foam. All you need to do is call or email us and let us know you need more adhesive foam and we would be happy to put some in the mail to you. As far as the smoke is concerned, that is caused not by the hurricane glass, but by burning candles that are of inferior quality. We recommend using candles that are no less than 50% beeswax to prevent dripping and smoking problems.